SSDs are beginning to dominate the hard drive market by replacing the roles of HDD in laptops and high-end desktops. SSD hard drives offer high performance at low power dissipation compared to the ordinary hard disks. However, it is important to make sure SSD drive is healthy in order to keep the good performance. In this article, you will learn how to check SSD Health on a Windows or Mac computer. There are a number of tools to check SSD health, but in this article, we’ll discuss only the best Windows and Mac Free tools to check SSD Health and Monitor Performance. In case an SSD drive failure has happened to you and caused data loss, it is important to know how to recover deleted files from SSD. Don’t hesitate to get lost files back with file recovery software. 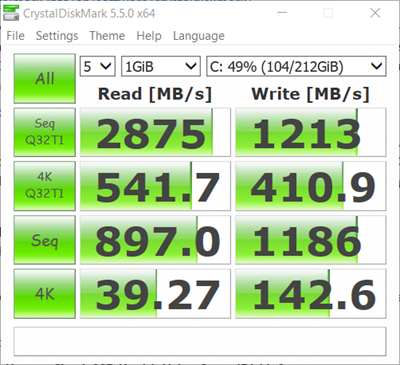 CrystalDiskMark is actually a benchmarking tool for testing the speed of write/read, which is one of the most important indicators of your SSD health. Download the small size package, then install it to your computer. The free app will tell you the current state of your SSD. CrystalDiskMark will allow you to choose a partition or folder of computer built-in or removable hard disk, then test the read/write speed under simulated conditions, like 4K and sequential. Once the test is done, you can know the SSD health status by comparing the result with advertised speed. You can buy a Pro version, or you can use the free version of SSD Life. The Pro Version isn’t very expensive so if you like the free version then you may want to try the full app. Once you’ve downloaded the app, install and run it. It will then tell you how your SSD is doing. This tool will measure your SSD’s lifespan giving you the opportunity to plan well for your data. With the knowledge of your SSD’s lifespan, you can know when to back up your data before your SSD wears off completely. SSD Life can work with most SSD manufacturers such as Kingston, OCZ, and Apple MacBook Air built-in SSD. CrystalDiskInfo is another freeware offered by individual developer. It supports a part of USB, INTEL RAID and NVMe, and helps to monitor SSD’s health status and temperature. Once installed, the intuitive interface will show you the health status of your SSD, with a list of parameters, including critical warning, available spare, media and data integrity errors, etc. There are several more interesting functions hidden in the menu. 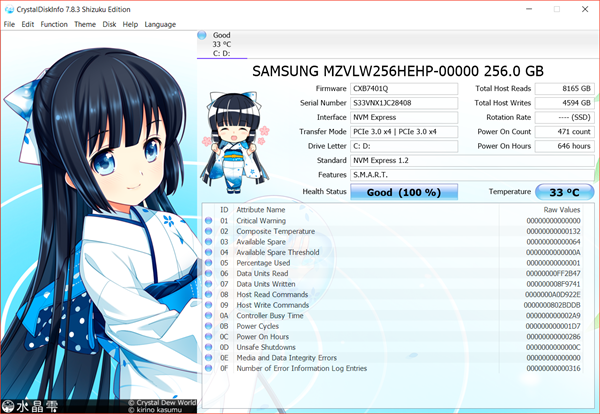 CrystalDiskInfo has three editions, namely Standard Edition, Shizuku Edition and Kurei Kei Edition, with Japanese anime images as UI background in the latter two versions. There is no more extra difference but for giving users fresh experience. Smartmonotools is an open-source tool for professional users since the operation will carry out in a CMD window. It offers real time monitoring of SSD Hard Disk with two programs, smartctl andsmartd. The two programs control and monitor computer storage systems using the Self-Monitoring, Analysis and Reporting Technology (S.M.A.R.T) system. 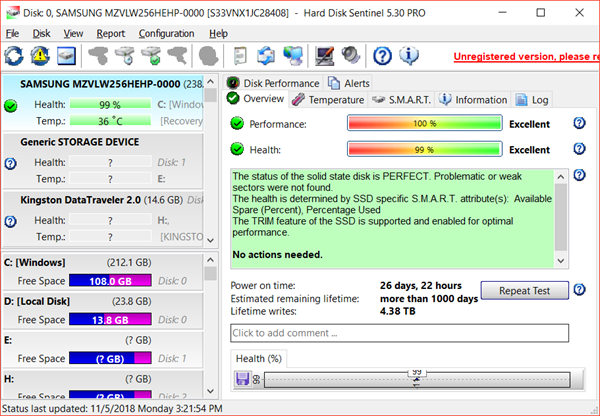 Once installed, Smartmonotools will display early warning signs of SSD problems detected by S.M.A.R.T., often giving notice of impending failure while it is still possible to back up the data. It supports ATA/ATAPI/SATA-3 to 8 disks and SCSI disks and tape devices. The tool can run on Mac OS X, Linux, BSD, Windows and others. 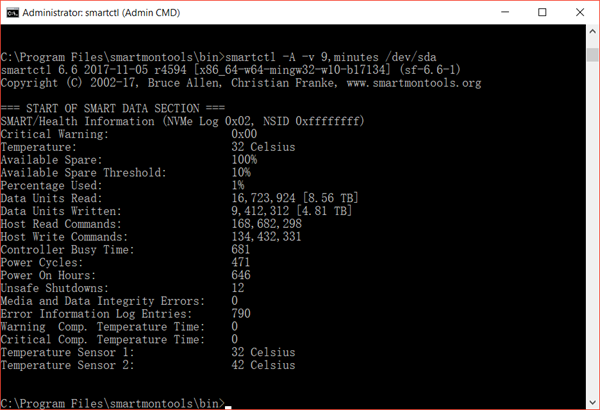 HDSentinel, short for Hard Disk Sentinel, supports Windows, Linux and DOS platforms. 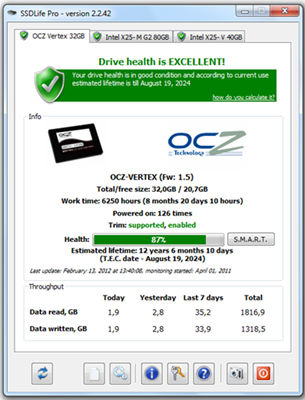 This SSD monitoring software is built to find, test, diagnose and repair SSD problems. Whether it is an internal or external SSD connected USB or e-SATA, this tool can scan and recognize your SSD health and generate reports with possible fix to solve the errors. HDSentinel is also able to show you the estimated remaining lifetime and lifetime writes. The pro version provides more functions, like automatic backup. 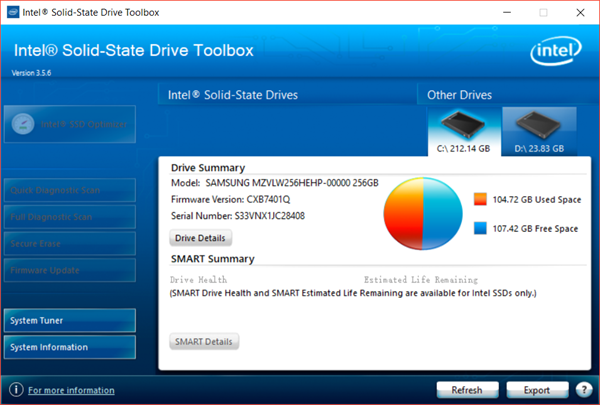 Intel SSD Toolbox allows users to check computer system information and SSD status. It also provides system tuner function to optimize the operating system. However, SMART DRIVE and SMART Estimated Life Remaining are available for Intel SSDs only. SSD helps computer system run faster and unless you’ve used one in your system, it’s hard to explain or truly appreciate how great it is. Fortunately, it will be more affordable and their lifespan will have improved. 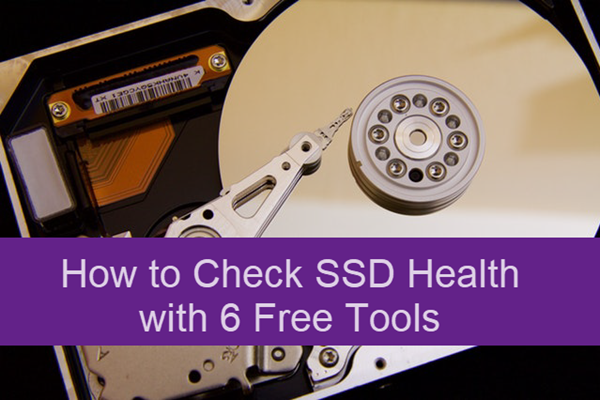 Nevertheless, if you have SSD, it is always important to keep an eye on its health status. Any one or two of the above free tools are good for home users. It is also important to back up SSD for important data.